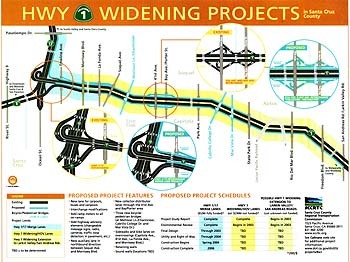 The broad Highway 1 widening project is broken into three smaller sections, each with its own planning and construction phases: the Highway 17 merge-lanes project, the Highway 1 widening from Morrissey to State Park Drive, and additional Highway 1 widening from State Park Drive to San Andreas/Larkin Valley Road. The first section is the Highway 17 merge-lanes project. It will add two extra lanes to the Highway 17/Highway 1 merge area: an extra lane northbound from Highway 1 merging onto Highway 17 and an extra lane southbound as Highway 17 merges onto Highway 1. Currently, southbound drivers have to merge quickly with Highway 17 traffic--the new arrangement would give them more time to get over. Construction was slated to begin in 2004 on this first portion of the project, but that date has been postponed indefinitely because the State Transportation Improvement Project (STIP) money that was to provide much of the funding for it has been blocked. It's currently stalled between two critical stages--the environmental review is complete, but the right-of-way acquisition won't materialize until the STIP money comes through. The second phase is the largest and most controversial. The Highway1 widening/HOV lanes project will add high-occupancy vehicle (HOV) lanes--or carpool lanes, to the rest of us--in both directions on Highway 1 from Morrissey Boulevard to State Park Drive. It will also add three pedestrian/bicycle overpasses--at Chanticleer, Cabrillo College Drive and Mar Vista Drive--and reconstruct several ramps. The most drastic ramp reconstruction will be the complete overhaul of the 41st Avenue and Bay Avenue/Porter Street section, where a frontage road will be added as an alternative to using the ramp as a thruway. The environmental impact report for the second section is already under way; and is expected to take between four and five years. In this time, the commission plans to secure funding and design the project. "The earliest you could get to construction under the best of scenarios is probably 2011 or 2012, but that's really ballpark," says Santa Cruz County Regional Transportation Commission executive director Linda Wilshusen. "You could start construction eight years away under the best of circumstances, and depending whether we add this third phase, who knows how long it could go." Speculation about how long the construction would take is difficult at this stage. A timeline depends on a variety of unknowns, including who the contracts will be given to and what the political and economic climate is once construction actually begins. The last section of the project involves widening from State Park Drive to Sand Andreas Road/Larkin Valley Road. Caltrans recommends widening this portion, but the commission has not yet made the decision about whether to do all the widening at once. From the December 17-24, 2003 issue of Metro Santa Cruz.